A Pewaukee family living in the Stillmeadow neighborhood wanted to update their master bathroom into a relaxing, beautiful space. The old bathroom had outdated tile, no bathtub and lacked storage. 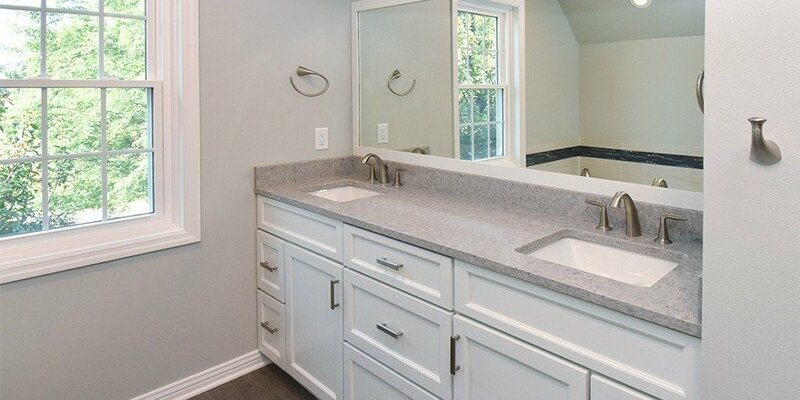 Kowalske Kitchen & Bath transformed the bathroom from dark and dated to light and beautiful. The new soaker tub is surrounded by gorgeous glass mosaic tile. The custom glass shower has two shower heads, floating shelves, a walnut floor accent and Kohler Choreograph walls. The dual vanity has Kohler fixtures and quartz countertops. The elegant space features new flooring, a private toilet room and recessed lighting. One of the highlights of the space is the Bluetooth speaker fan for listening to music while showering or enjoying a bath.